Five students joined us to this weekend to carve their Rocking Horse heads in our purpose built carving studio, under the watchful eye of master craftsman Anthony Dew.These courses are aimed at those wishing to make a traditional carved Rocking Horse. 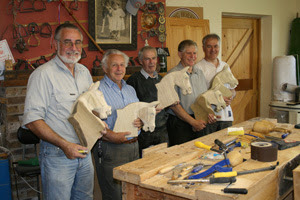 Renowned expert Anthony Dew will show you the traditional approach to Rocking Horse carving using hand tools. Previous carving experience in not necessary â all skill levels are accommodated, and each student will successfully complete the carving of a Rocking Horseâs head during the Course!The course fee includes:-Three days individual tuition with master carver Anthony Dew Use of workshop equipment and all carving tools (but you are very welcome to bring your own) Lunch, usually cold meats and salads, as well as refreshments Head & Neck Timber for Medium Size Horse, prepared ready for you to commence carving. (Several âalternativeâ medium size heads will be offered. You may upgrade to Large at an additional cost of Â£10.) Carve-a-Head courses run 10am till 4pm on the first two days, 10am to 3pm on the final day (but we will start earlier and run later if need be! ), with a maximum of 6 students on each course. 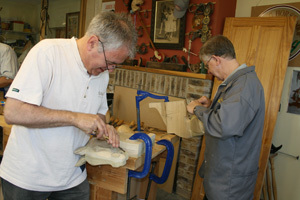 These Carve-a-Head course take place in our purpose built carving studio. We shall look at many aspects of traditional Rocking Horse making including carving techniques, gouge grinding/sharpening, the use of hand carving tools (incl. power carvers) and different makers approaches etc. Course Fee: 3 day Carve-a-Head Course - Â£280.00 per person (Price includes VAT- members or Friends of The Guild of Rocking Horse Makers receive a 5% discount) Accommodation is not included, but we can recommend several local B & Bâs, pubs or hotels, and will send you a list on request. (Please note: The Course does not cover the laminated designs.) If you would like to join us on one of our courses go to http://www.rockinghorse.co.uk/ or give us a call on 01759 368737.